Welcome to the Training Resource Center. Here you will find training videos, manuals, tips and more to help improve your key cutting knowledge. Welcome to the Video Download Center, a video on demand service from Hy-ko. Please begin by choosing one of the links below. We will continually be updating our library of videos, so be sure to check back soon for more information from Hy-Ko. These videos are a great resource for anyone new to key cutting. From how to load keys into the jaws to replacing the cutter, brush and properly calibrating the machine, these videos provide all of the information needed to use and maintain your Promatic-100™ key machine. Learn how to use Hy-Ko's 303 Sidewinder key cutting machine. Identification of the right key blank for a customer begins with knowing the different parts of a key. The key head or bow is often a design that's unique to a particular key and/or lock brand. Over time, you'll become familiar with the various head designs, which will help you select the right key blank for duplication. All heads also have a key chain hole for attachment to a key chain or key fob. The key shoulder stop is one of the most important parts of a key. Not only does it control how much of the key blade will enter a lock, but most importantly, in many cases it is used to align a key and a key blank in a key machine for the tracing and cutting process. Making sure that the shoulder stop on a key blank matches the shoulder stop on a customer's key will prevent miscuts. Key millings or grooves are unique and allow a key to fit into a particular key cylinder. The pattern of the millings and their length are another part of a customer's key that will lead to the selection of the right key blank for duplication. The key blade is the part of the key from the shoulder stop to the tip. The length of the blade on a customer's key is another factor in selecting the right key blank for duplication. The key tip is the bottom of the key. Some keys do not have a shoulder stop. 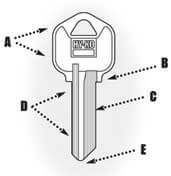 As a result, the key tip is used to align a key and a key blank in a key machine for the tracing and cutting process.